INSIDE THE EARTH from the bestselling Magic School Bus series taught thousands of kids about rocks, volcanoes, and the earth's core. 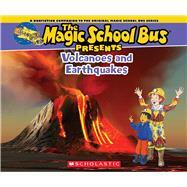 MAGIC SCHOOL BUS PRESENTS VOLCANOES & EARTHQUAKES will expand upon the original title with fresh and updated content. MAGIC SCHOOL BUS PRESENTS VOLCANOES AND EARTHQUAKES will explore the explosive and earth-shattering forces of our planet. With vivid full-color photographs on each page as well as illustrations of the beloved Ms. Frizzle and her students, the Magic School Bus Presents series will enthrall a whole new generation of Magic School Bus readers.